The cervical spine is the upper portion of your spinal column that connects your brain stem to your spinal cord. It is a complex region of your body rich in blood vessels and other soft tissue, such as ligament and tendons. The cervical spine starts at the atlas, the top cervical vertebra (also referred to as C1), and continues down to the C7 vertebra. Neck pain is slightly less common than back pain, but no less significant or treatable. Cervical stenosis, a condition caused by a herniated disc or degenerative joint that can cause pain to radiate down the arm and/or lead to shooting pain and coordination problems in the arms or legs. Muscle-strain degeneration of facet joint cartilage. Osteoarthritis of your weight-bearing joints, such as those in your hips and knees. A sprain of the muscles, ligaments, or tendons in the neck area usually causes acute neck pain. Motor vehicle accidents, repetitive stress such as lifting heavy items on a regular basis, or less-than-optimal sleeping positions can often be identified as a root cause of neck pain. Most minor tendon- or ligament-related pain in the neck can be remedied with proper care, which may include rest, ice or heat application, and supervised rehabilitation by a chiropractor here in our Gaithersburg office. A very common complaint from people experiencing neck pain is an associated ache or numbness/tingling that can radiate down through the shoulder and/or arm. This can also be accompanied by numbness, tingling, and a weakening of the muscles of the arm, hand and/or fingers. Foraminal stenosis, is a degenerative condition caused by changes in the cervical spine (your neck) over time and is usually brought on by the aging process. Foraminal stenosis is typically caused by a herniated disc, bone spur, thickened ligaments, tumors, or spinal injuries that result in a narrowing of the foramen (an archway in between your vertebrae) through which your nerve roots pass. When this opening is narrowed due to a prolapsed or herniated disc encroaching into the space, the nerve root(s) that travel through the opening can become crowded (or “pinched”). Pressure on nerve roots in the cervical spine region can cause chronic neck, shoulder, arm, or hand pain. 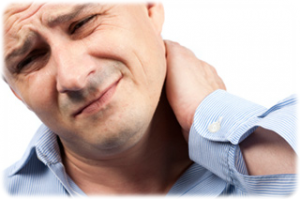 If you are experiencing neck pain or any of its associated symptoms, you shouldn’t delay in seeking treatment. Dr. Davis has seen thousands of patients with neck pain and can help diagnose the cause your specific pain and start you on a path to pain relief. Most cases of neck pain can be treated conservatively and successfully without the need for surgery or excessive medications. During the course of your treatment, Dr. Davis will order any diagnostic tests (X-Ray, CT Scan, MRI, ultrasound) necessary to diagnose and treat your condition. If tests or treatment reveal a more serious problem, Dr. Davis has forged relationships with many of the finest local physicians and surgeons and can refer you for further evaluation and treatment. Don’t delay if you’re experiencing neck pain. Whether it’s caused by a car accident, sports injury, everyday activity, or as a natural part of the aging process, addressing the problem early is one of the best ways to avoid the need for more invasive treatment down the road.